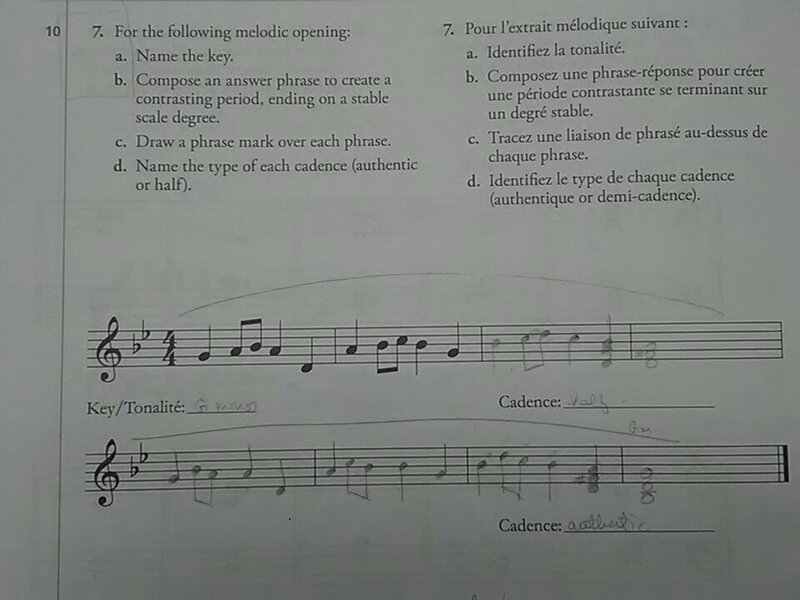 This question (and my attempted answer) is from a practise test booklet for the RCM Grade 8 Exam I'm going to take. I have a few questions regarding composing melodies and also cadences. So in part b) it says to compose a contrasting period. Is my melody different enough from the first part? Also, is my melody acceptable? A "stable scale degree" means a note that is in the triad of the chord, right? My last question is: did I fill in the cadences correctly? I think they need to be in root position, so should I fix that? I mean, add the root note of the chord below the triads that aren't in root position? General tips would be helpful too. Yes, your phrases are contrasting. The acceptableness of a melody is highly subjective, and I do not know what the exam is asking for. If you have a rubric of qualities for the melodic line, that would be helpful. I am not sure what "stable scale degree" means as that is a bit subjective. One might say it is a note in the tonic chord, but another might say it is only the root or 5th. You ended on a note in the V chord for the first phrase, and on the tonic note in the second phrase, so you are fine. Your cadences are labeled correctly, but I don't know why you have triads spelled out there. If they are asking for melody, you only need the one note. The chords are implied. However, if you are required to fill out the notes of the triad, you did so in the most logical way given the melody you have. Not the answer you're looking for? Browse other questions tagged composition melody or ask your own question. Melodic Equivalence of a rhyme? Is there some way to quantify melodic transitions?